MH-type (H-type)metallic yarn are made from one M-type (unsupported) metallic yarn twisted with another yarn to produce different types of MH-series products. 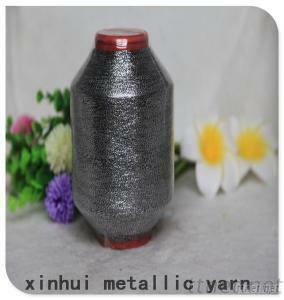 MH-series metallic yarn has a nice soft touch and it has more than a hundred colors for you to choose from, you are welcomed to ask for a copy of our color book for your reference. The usage of MH-series is pretty wide, it is mainly used on knitted fabrics, sweaters, stockings, tricots, and a lot more. Extra fine H-series metallic yarn, the KH-Type, is also available now, it has a extra smooth touch which is more popularly used on stockings and underwear. You are welcomed to contact us for more details.